"What the Hell Is It This Time?" "Edith Piaf (Said It Better Than Me)"
Hippopotamus is the 23rd studio album by American rock group Sparks. It was released on September 8, 2017 through BMG Records, their first record issued on a major label for decades. Following the 2009 radio musical The Seduction of Ingmar Bergman and Sparks' subsequent collaboration with Franz Ferdinand in FFS, the release of Hippopotamus marked a return to the traditional Sparks format of "short, literate, witty pop songs", mixing elements from the band's various stylistic periods. Hippopotamus was met with critical acclaim, and entered the UK Albums Chart at no. 7, Sparks' first UK top-ten appearance in over 40 years. Having spent much of the past decade working on two musicals, The Seduction of Ingmar Bergman and the forthcoming movie musical Annette, a collaboration with French director Leos Carax, the Mael brothers set out to return to a more traditional song-oriented, rather than narrative, pop format for their next Sparks release. They worked on the album over a 10-month period, starting at the beginning of 2016 and ending in October, with most of the recording done in Russell Mael's home studio in Los Angeles. Stylistically, Hippopotamus was classified as baroque pop by journalist Claire Biddles, and simply rock by reviewer Sandy Lewis. The album was published via BMG rather than the Maels' own Lil' Beethoven label. BMG had just taken on the publishing rights for Sparks' back catalogue, which had come up for renewal. "Once we did a publishing deal with them," Russell Mael told PopMatters, "the record label side of BMG really was interested in listening to the new album. So they flew out from London and we played them the album and they just kind of flipped out and said, 'This is amazing, we need to do the record deal now as well.'" BMG signed the album worldwide. Sparks are touring Europe and the United States in support of the album. 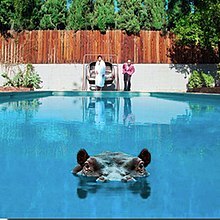 Hippopotamus has a score of 81 out of 100 on the review aggregator website Metacritic, based on 17 reviews, indicating "universal acclaim". The album entered the UK charts at no. 7, Sparks' first top-ten appearance in the UK Albums Chart since Propaganda in 1974. In a five-star review for The Independent, Andy Gill described Hippopotamus as a "glorious and inventive return from the Mael brothers ... smarter and more satisfying than ever." Leigh Sanders, writing for the Express & Star, described the album as "magnificent", while Dave Simpson in The Guardian called it the group's "best album in decades", with songs that had "a new emotional heft" to them. Daryl Easlea's review in Record Collector noted that "Ron's lyrics, as always, locate the heart of the matter, finding the chink in the armour, the dust on the lens" and described the album as "exactly what you'd expect and more besides." Q characterized it as a "straight-up Sparks LP". Reviewer Andrew Perry said that it is "laced with all the latterday narrative leanings, Broadway arrangement and pastiches" while adding, "as ever, there's much fun to be had". Mojo concluded that "beautifully offset by Ron's offbeat pop-classical arrangements [...] Hippopotamus is never anything less than wildly entertaining". In a review rated 8.9 out of 10, Paste praised "its multifaceted compositional creativity, coupled with its consistently fetching melodies and words". In a review rated 8 out of 10, Clash noted that Hippopotamus was "wryly humorous" and "Pure vaudeville, pure theatre – and pure Sparks". The Times, in another five-star review, declared: "Russell's fraught falsetto may suggest high emotion, the melodies may be affecting, but Ron's lyrics never assume that the listener is interested in the brothers' life". For reviewer Will Hodgkinson, "this is bright, witty music that lives on the margins". Uncut rated it 8 out of 10. Reviewer Jason Anderson said that it "is wide and rich enough to provide no end of delights", whether it's an ode to Swedish aesthetics, "a celebration of Gallic cool or marvels too many to count". Commenting on the album's musical style, Randy Lewis, writing for the Los Angeles Times, said, "'Hippopotamus' brings the Mael brothers back more into the realm of rock music with the inclusion of electric guitars, bass and drums largely absent from their more orchestral-driven outings of the past decade-plus", concluding the album was "simply put, genius". Rob Mesure of musicOMH judged the album "a varied and immensely satisfying set, picking elements from their different eras – from oddball, articulate rock, through synthpop, to opera – and tossing them nonchalantly together – adding a smattering of drum'n'bass (Giddy, Giddy) and cool, flatpacked Europop (Scandinavian Design) – like the assortment of objects floating in the pool of the title track ... a big, joyous beast of an album." Leos Carax – vocals and accordion on "When You're a French Director"
Rebecca Sjöwall – vocals on "Life with the Macbeths"
^ a b c d e f g Paul, John (September 13, 2017). "Expect the Unexpected: A Conversation with Sparks". PopMatters. Retrieved September 13, 2017. ^ a b c Gill, Andy (September 7, 2017). "Album reviews: Sparks, Neil Young, The National, Tori Amos, The Waterboys and more". The Independent. Retrieved September 9, 2017. ^ a b Mesure, Rob (September 9, 2017). "Sparks – Hippopotamus". musicOMH. Retrieved September 10, 2017. ^ a b c "Hippopotamus by Sparks". Metacritic. Retrieved September 9, 2017. ^ a b "Official Albums Chart Top 100". Official Charts Company. Retrieved September 16, 2017. ^ a b Copsey, Rob (September 15, 2017). "The National secure their first Number 1 on the Official Albums Chart with Sleep Well Beast: 'It means a lot'". Official Charts Company. Retrieved September 16, 2017. ^ a b Robson, Adam (August 18, 2017). "INTERVIEW: Far Out talk to the pop innovators Sparks about their new album Hippopotamus, new fans, and their thoughts on politics in music". Far Out Magazine. Retrieved September 13, 2017. ^ a b Roberts, Randall (September 11, 2017). "Ron and Russell Mael of Sparks discuss new album 'Hippopotamus' and how their musical 'Annette' is colliding with 'Star Wars'". Los Angeles Times. Retrieved September 13, 2017. ^ Biddles, Claire (September 2, 2017). "Hippopotamus review". thelineofbestfit.com. Retrieved September 15, 2017. ^ a b c Lewis, Randy (September 11, 2017). "On 'Hippopotamus,' Sparks shows pop genius on topics fleeting to ginormous". Los Angeles Times. Retrieved September 12, 2017. ^ Deming, Mark. "Sparks Hippopotamus". Allmusic. Retrieved September 13, 2017. ^ Sylvester, Daniel (September 12, 2017). "Sparks Hippopotamus". Exclaim!. Retrieved September 13, 2017. ^ a b Simpson, Dave (September 7, 2017). "Sparks: Hippopotamus review – Ron and Russell Mael at their arch-pop best". The Guardian. Retrieved September 9, 2017. ^ Murphy, Lauren (September 7, 2017). "Sparks – Hippopotamus review: still crazy after all these years". The Irish Times. Retrieved September 10, 2017. ^ a b McNair, James (October 2017). "Sparks Hippopotamus". Mojo: 88. ^ Chris, Randle (September 13, 2017). "Sparks: Hippopotamus Review". Pitchfork. Retrieved September 13, 2017. ^ a b Perry, Andrew (October 2017). "Sparks Hippopotamus". Q: 111. ^ a b Easlea, Daryl. "Sparks – Hippopotamus". Record Collector (September 2017). Retrieved September 9, 2017. ^ a b Hodgkinson, Will (September 8, 2017). "Pop review: Sparks: Hippopotamus. The arcane, dapper outsiders are still brilliant in their fifth decade". The Times. Retrieved September 9, 2017. ^ "Sparks". Official Charts Company. Retrieved September 19, 2017. ^ Sanders, Leigh (September 8, 2017). "Album Review: Sparks – Hippopotamus". Express & Star. Retrieved September 9, 2017. ^ Blum, Jordan (September 12, 2017). "Sparks: Hippopotamus Review". Paste. Retrieved September 13, 2017. ^ Smith, Mat (September 11, 2017). "Sparks – Hippopotamus". Clash. Retrieved September 13, 2017. ^ Anderson, Jason (October 2017). "Sparks Hippopotamus". Uncut. ^ "MOJO's Top 50 Albums of 2017". Album of The Year. Retrieved December 14, 2017. ^ "Glide's 20 Best Albums of 2017 & Honorable Mentions". Album of the Year. Retrieved December 20, 2017. ^ "Q Magazine's 50 Best Albums of 2017". Album of The Year. Retrieved December 14, 2017. ^ "Classic Rock Magazine's 50 Albums of 2017". Album of The Year. Retrieved December 14, 2017. ^ "Uncut's 75 Best Albums of 2017". Uncut. November 21, 2017. Retrieved November 21, 2017. ^ "the best albums of 2017 - Fopp". Fopp. November 23, 2017. Retrieved December 20, 2017. ^ "Sparks – "Hippopotamus" Video". Stereogum. Retrieved March 28, 2017. ^ "Ultratop.be – Sparks – Hippopotamus" (in Dutch). Hung Medien. Retrieved September 16, 2017. ^ "Ultratop.be – Sparks – Hippopotamus" (in French). Hung Medien. Retrieved September 16, 2017. ^ "Lescharts.com – Sparks – Hippopotamus". Hung Medien. Retrieved September 19, 2017. ^ "Offiziellecharts.de – Sparks – Hippopotamus" (in German). GfK Entertainment Charts. Retrieved September 15, 2017. ^ "Dutchcharts.nl – Sparks – Hippopotamus" (in Dutch). Hung Medien. Retrieved September 22, 2017. ^ "Official Scottish Albums Chart Top 100". Official Charts Company. Retrieved September 16, 2017. ^ "Sverigetopplistan – Sveriges Officiella Topplista". Sverigetopplistan. Retrieved September 15, 2017. Click on "Veckans albumlista". This page was last edited on 23 March 2019, at 06:08 (UTC).